The Litter Data Screen displays a summary of each of the litters for a specified doe. Litters can be entered in any order, the program automatically sorts them out so that the oldest litter is number one, and so on. In addition to the chart, a bar graph of the number born vs. number weaned is also shown. The table and the chart can each be printed out. The Kin Screen shows the siblings or descendants of selected animal. It can also be used to view the descendants of a buck/doe pairing. When viewing siblings, full siblings are shown in black, siblings that share only the dam are shown in red, and siblings that share only the sire are shown in blue. The Financial Data Screen shows the cash flow for your rabbitry. Every time you sell an animal, the sale price is automatically recorded as income, and every time you complete a show entry form, the fees are recorded as an expense. 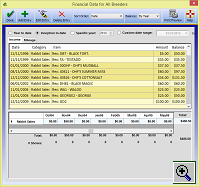 A separate data input screen is also provided so that you can enter all of your other income and expenses. Each of your expenses can be assigned to a category, so that you can quickly see, for example, how much you have spent on feed or medication, or how much you have earned from pet sales. The program comes with several pre-defined categories, but you can add as many other categories as you would like, to help you create a clear picture of your income and expenses.